How To Order Stock – How can we help? 1. Head to Products -> Stock Control. 2. Select Order Stock. This will direct you to the page New Purchase Order. 3. 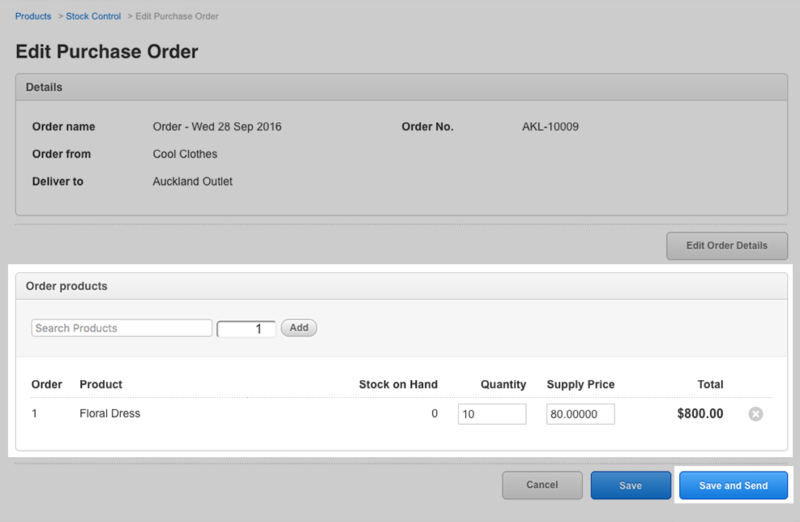 Select the supplier you are ordering stock from the Order form drop-down field. 4. Choose where you wish to have the stock delivered to by clicking on the Deliver to drop-down menu. 5. Choose a name /reference which will be used to identify this order. 7. Click on Save and you will be taken to the Edit Order page where you can start adding products to the order. 8. Add products by typing in the product name in the search box; Vend will bring up the product, and if there are several similar products, click on the correct one. 9. Enter the quantity of this product that you would like to order. 10. Click Add, this will create a line in this window showing the details of your order including the cost of the stock. Keep adding products until your order is complete. Note: If you have set up or are using barcodes for your products, you can add your products by scanning your barcodes; ensure that you have selected the product search box before scanning. 11. Once complete, click Save to save your changes or Save and Send if you are ready to send it off to your supplier now. To add any product, by any supplier, to an order, you will need to select any supplier from the Order From dropdown when you create a new order.